Many times I catch my self saying, “I wish something exciting would happen.” Something positive and fun, but totally unexpected. A few weeks ago I was walking through the woods behind our house and discovered a surprise—literally—from out of the blue. Huge clusters of ripe blueberries hung everywhere like small grapes—ripening in the green grass. This year’s perfect weather conditions of ample rain and no late spring frosts, had left the berries thriving like I’d never seen before. 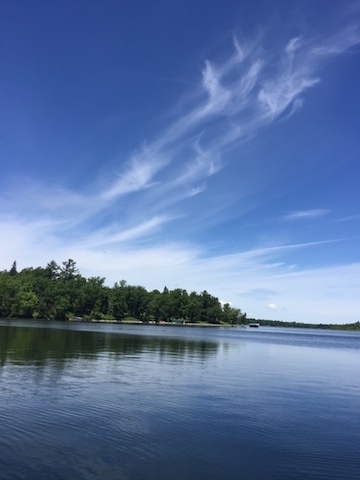 Then while in the boat one day, I enjoyed a whimsical cloud formation that seemed magically painted on the perfect sapphire sky above. It made a striking contrast against the deeper shades of blue water below. Days later, unexpectedly, my book—Sowing Northern Fields placed second in one of RWA’s biggest contests—2018-Romance Through The Ages (RTTA) Contest. The contest was sponsored by the Hearts Through History Writers. The recognition is huge in getting someone to seriously look at my book. Take a moment this busy summer and appreciate the unanticipated moments that make life much more fun and interesting. I am so thankful for many of the things in my life that come from—out of the blue.